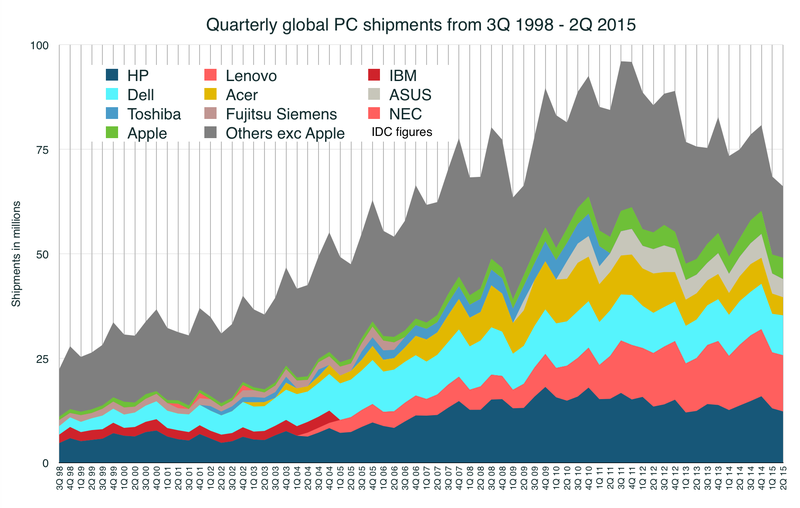 IDC data shows how the PC business has grown – and shrunk. “Others” (grey) are selling fewer and fewer. Perhaps predictably, this observation of what the numbers were saying riled some of the PC diehard commenters (generally sysadmins with time on their hands who obsessively trawl comment threads looking for places in which to be superior). “I’m looking forward to seeing the looks on Mac users’ faces when Apple – as they display every intention of eventually doing – pull out of the PC market altogether,” said one. What gets people buying computers? Seems that Apple has the answer – launch new products and promote the hell out of them. (In the second quarter it refreshed the MacBook Air, MacBook Pro and introduced the “MacBook”.) It’s working a lot better for them than for the Windows PC market. Apple has stayed fairly consistent, shipping between 4m and 5m personal computers per quarter – apart from the first half of 2013, when it couldn’t supply enough new iMacs to meet demand. The demand for Macs means that Apple is now the fourth-largest PC company for shipments, behind only Lenovo, Dell and HP, and ahead of Asus and Acer, on IDC’s measurement. (IDC doesn’t include Chromebooks and 2-in-1s.) It’s quite a turn of events, but one where it has grown faster than the Windows PC market for quite a long time. The deeper question is: what happens to the PC market? It’s become a replacement business, but one in which replacement cycles are also lengthening. There’s barely any innovation – Lenovo’s efforts with the Yoga 2-in-1 seems to be the only thing happening, and that’s a minority sport. Gartner and IDC don’t give clear figures, but there doesn’t seem to be a big move to the new form factors. Thing is, it’s usually new form factors that drive revivals in the market. So far, though? No. Canalys reckons that in Q1 “hybrid and convertible” shipments (that’s the 2-in-1s, and includes the Surface) totalled 3m, and that was a doubling year-on-year. There’s likely money to be made, but not many buyers handing over the moolah. And Chromebooks? A mighty 1.3m in Q1, also according to Canalys, which reckoned 90% went to the US and Europe. I don’t hold out much hope for a gigantic leap in Q2, though education buyers (the principal ones) will likely bump those Chromebook numbers up in Q3. 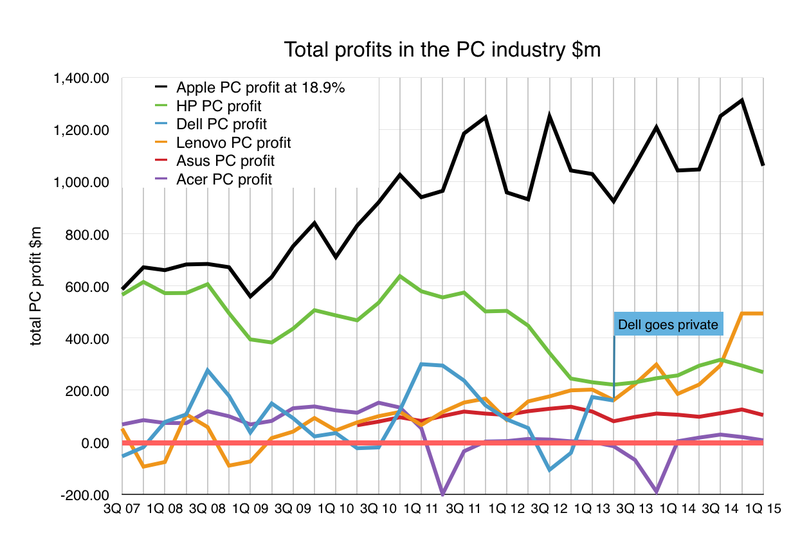 I track the big PC companies’ results, where you can generally find both revenues and operating profits for their PC divisions, though not usually PCs shipped (I take the latter from IDC). Apple is different – it gives you shipments and revenues, but no calculation of operating profit (because it doesn’t split out its figures that way). 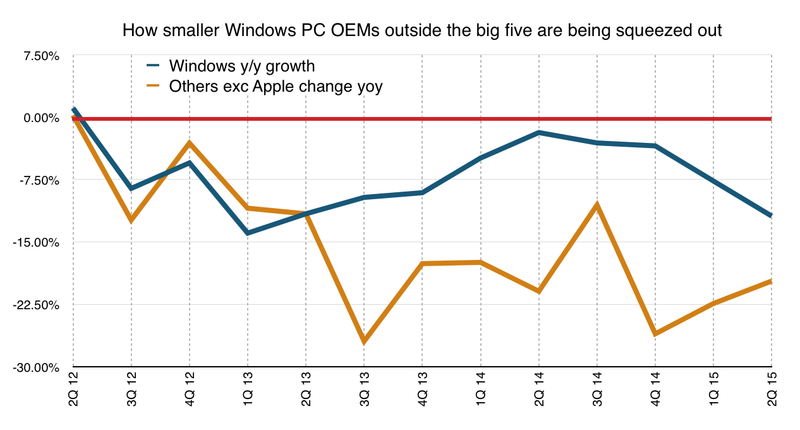 And over the past 10 years, there are two trends that stand out: per-PC revenues have been falling along with per-PC profits for Windows makers, while Apple has seen similar pressures but sits miles ahead of the rest. “Big six” per-PC revenues, based on financial reports and IDC data. The picture gets even worse if you look at total profits. We have to assume an operating profit for Apple; I use 18.9% because that’s the historical figure, extracted from pre-iPod days. 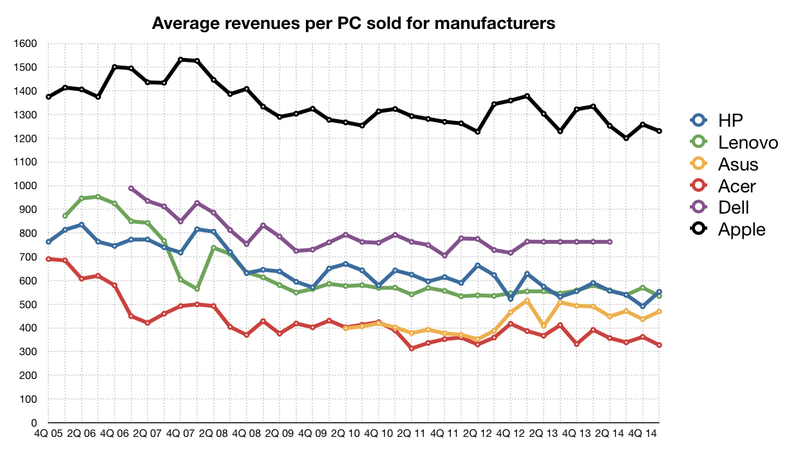 On that measure, Apple makes the largest profit from PCs by a mile. But if profits are squeezed for the “big five” (or six, now Apple’s in the club), what’s it like for the smaller players such as Toshiba, Samsung, LG? Logically, worse, because just as in the smartphone market they don’t get the economies of scale that let them compete. The problem is, there just isn’t room for them. Having been above 50% of the whole market back in 2005, they’ve tumbled down until now they’re trending below 30%. From 50% before, “others” are now less than 30% of a smaller market. The red line is the four-quarter moving average. 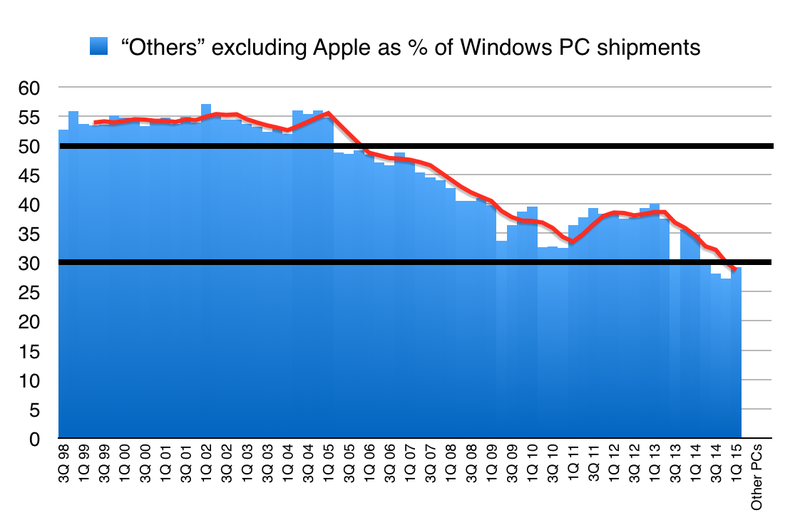 Since the market began shrinking, shipments by “Others” – those Windows PC makers outside the top five (HP, Lenovo, Dell, Asus, Acer) – have really fallen off. 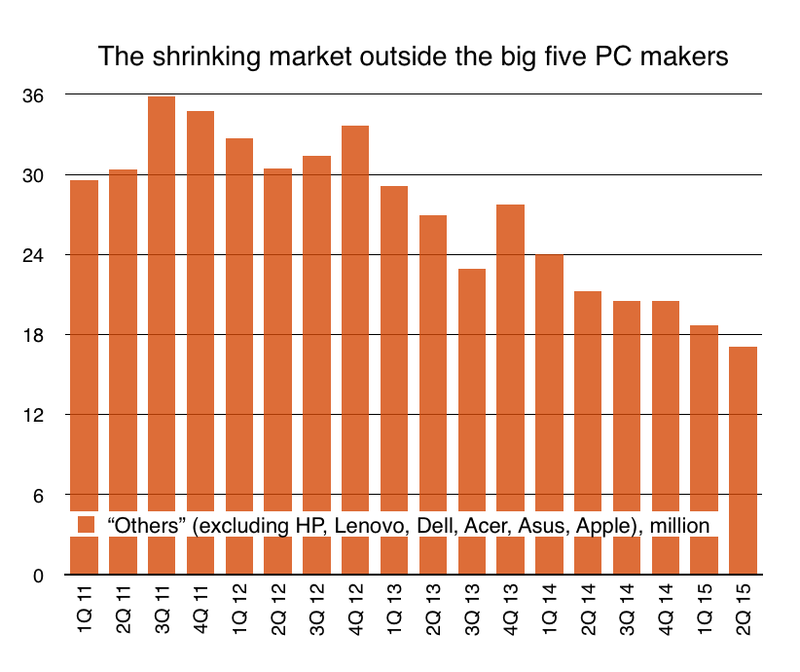 As the PC market has shrunk, the “Others” category has shrunk faster. “Others” (the remainders outside the top six if you include Apple) has dropped from just under 36m to less than 18m in less than four years. That’s a real crunch. That means fewer sales, less revenue and less profit (if any) for those bit players – which includes Samsung, LG and a few others. Sony gave up PCs as a bad idea a while back. Samsung pulled out of the European market in late 2014. Samsung, in particular, doesn’t have anything to gain from making PCs: it can’t make the chips in its foundries (they’re Intel not ARM) and it’s not generally offering touchscreens, so it doesn’t get the “flywheel effects” that it relies on for smartphones, where it makes the parts as well as the finished object. If I were to bet, I’d expect Samsung to exit the PC market in a year or two. There just isn’t much in it there; you can see from the part of its “IM” division revenues that aren’t smartphones that it’s dwindling. There isn’t any good news for the PC industry, and I don’t expect Windows 10 to bring about dramatic changes. (Nor do IDC and Gartner.) There’s always a PC sales lull ahead of a Windows launch, but there’s still not great driving reason for the average consumer to buy a new PC because of Windows 10; remember how Windows 8 didn’t help that downward plunge. And for businesses, if they’re on Windows 7 then they probably won’t see any reason to shift to Windows 10. And they probably binged on upgrades moving up from XP last year. So get used to the new normal: PC sales will be increasingly concentrated among the top five or six, for whom R&D is pretty much an afterthought, and Apple is coining it – and pushing with the R&D – just as it is in phones. How long before Apple’s share is 10%, up from its current 7.8% (which has more than quadrupled from its sub-2% low in the end of 2004)? 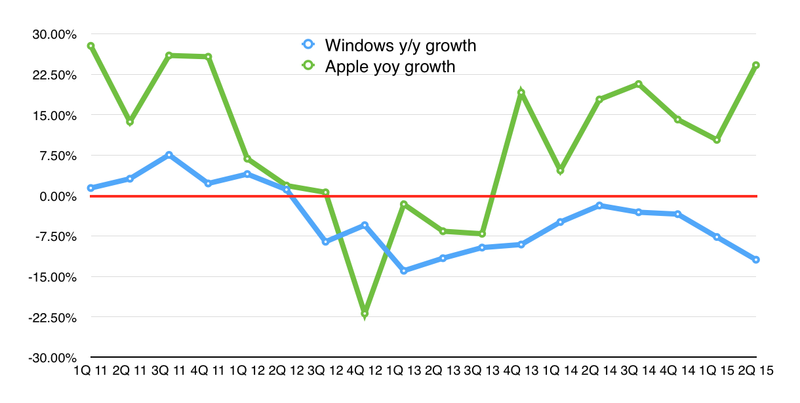 On current trends (falling PC sales/rising Apple sales), it might be a year or two, but it seems shockingly in reach. And those “Others”? With less and less market to shoot for, I’d expect some to quietly exit. Sony can’t have been the only one losing money. This entry was posted in journalism and tagged apple, pc by charlesarthur. Bookmark the permalink. For me the point at which I started to think that the (Windows) PC market was doomed was when I came to the realisation that the margins were so low that profit on sales came from the bounty on pre-installed.Anti Virus software. That since Windows 7 one has been able to use add-on software free from Microsoft as a consumer user, and since Windows 8 AV has been built into the product – well, alarm bells should be ringing if they hadn’t been disabled by the pre-installed “internet safety” package. Please use the same color for a company across figures.